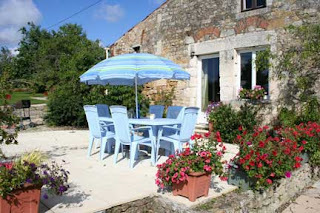 Split Level Gite, 3 Bedrooms, 2 Bathrooms, Central Heating. Four burner cooker with oven. Plenty of work surfaces and cupboard space. Solid Pine Table and Chairs. Good views over the gardens and countryside. on split level opposite Bedroom 1. Small patio by the car park and split level entrance. Parosol and entrance to Kitchen/diner. Good views over the landscaped gardens. Out door pool fenced for security. As the main season for enquiries quickly approaches there are some very nervous mutterings throughout the holiday industry. For the last few months the rate of inquiries has all but dried up, virtually every major site on the net has reported at least a 50% drop in the volume of enquiries and of those who are looking most are just window shopping. Everyone is feeling the pinch as a result of the credit crunch, the doom and gloom portrayed every day on the TV and other media doesn’t help and all in all it leaves one feeling that this will be the worst season ever. There are of course exceptions, in general the larger the property, the more exclusive, the more facilities on offer, and to a point the more expensive, the better the property seems to be booking. A detached five bedroom gite with a private heated pool and all the luxuries seems to have a greater occupancy rate already. This is probably due to two main factors, firstly they are rarer and therefore visitors who regularly use this size of accommodation know that if they leave it too late to book they will end up with little or no choice. Secondly, although difficult to explain, it seems the higher the price of the property the easier it is to let, it seems that many of the public think that the more they pay the better their experience will be. It is also true to say that 10 people sharing a luxury gite at £2500 per week is better value that 2 people in a £500 per week basic gite, especially when you take the cost of ferries and fuel into consideration. So where does one go from here? Well one could just say “don’t panic it will all sort it self out in the end”, one could double the advertising budget in an attempt to catch those few visitors that are looking, one could cut back on expenditure making economies to maximize what profit there may be, or one could think positively and upgrade the gite with a pool, a dishwasher, some new furniture or whatever else you think might encourage people to book with you. One could reduce the price or make special offers, why not try a "BOGOFF" buy one get one free, for example, book two weeks in high season and get two weeks free at another time of the year. The problem is there are no certainties only great debating topics. What are you going to do? I hear you say, well I’ll probably try a mixture of all of them, I've never been one for putting all my eggs in one basket. Of Course I will continue to try and get better rankings for the website. The principal question is what keyword is the most important for me to rank for. The answer? Well that will be the subject of another blog, so if you’re interested in finding out, keep checking in. With the majority of the competitors now in the Doldrums just north of the Equator the daily miles totals have dropped dramatically. 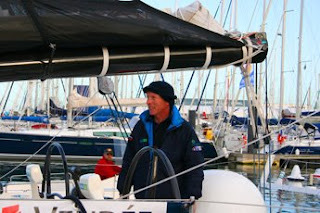 There is now laess than fifty miles seperating the first 5 boats after 10days of racing. Leading still is Loick Peyron in Gitana, 2nd is Sab Josse in BT and third is Armel le Cleac'h in Brit Air. Of the British contenders Mike Golding in Ecover has moved up to 6th, Samantha Fox in Roxy is 11th, Brian Thompson in Bahrain Team Pindar is 12th, Dee Caffari in Aviva is 15th and steve White in Toe in the Water is 16th. The Doldrums are so unpredictable that the change of position can often be a question of luck, being in the right place when the winds pick up, rather than on skill and tactics. It should be noted that mike golding has covered a lot more ground than the rest and I sucpect that it because hes taken more westerly to better the advantage when they reach the daldrums. With the autumn now well into its stride and my short break down to the family apartment in Spain quickly becoming a faded memory its time to restart the winter work. When the weather is good then outside work in the garden is a major priority, it's the time to remove the last of the summer bedding plants, to collect up those fallen leaves even though they have not all fallen yet as they stain the light coloured patio slabs and generally make the garden look untidy. It is surprising how one can get depressed when the skies are grey and the paving is dull and one starts to wish that spring would hurry up and come, yet just the brightening up of patios and the tidying of garden in general can lift the spirit. There is of course other work needed to be done, the general maintenance of the buildings, treating all the outside timbers, filling those bits of jointing in the stone walling that have worked loose, those bits of damage the guests have caused in the garden and around the buildings, on a vast site like ours there is always something needed to be done. When the weather takes a turn for the worst or when a change of work is required to ease those aching bones then inside there is endless work awaiting. The Tournesol gite is nearing completion of its make over, the new laminate floors are down in the bedrooms, it just needs the skirting boards to be put in place and we will be there. Then it’s on to the Frene Gite with a new tilled kitchen and upstairs bathroom. Over in the games hall the new toilet block is all but finished and a start on the new storage rooms is under way. We try to keep at least one spare of everything from complete toilets to curtain poles for during those hectic summer months you know someone will have an accident, something will break and as Murphy is alive and well in the Vendee you know it will happen at an inconvenient moment, the week end, bank holiday or what ever when getting a replacement is impossible, so having a spare is not only convenient but saves money and frustration and usually leaves the guest well impressed at your efficiency. The main problem in the past is having all those spares where I can find them. We have precious little storage space except for the large barn, but that needed compartmenting so that it can be easily found and out of the way from the guests, so new rooms have been formed for specialist things like, furniture with racks for new mattress's, chairs, bedside tables etc., another for everything for the kitchen, one for sanitary and plumbing and one for electrical. The draw back to all this new organisation is that now many of my competitors with gites will now know that i have that convenience store that they can tap into in their hour of need and as I never refuse I may just have to add a few extra items to the store. The other major job for the winter ahead is to review the websites, perhaps take a course in how to get better exposure for them and plan the campaign for new pages of information for the visitors to the site; this is of course hampered by not knowing exactly what information they would like. This years offerings on Restaurants especially around Fontenay le Comte was well received as was the pages on the beaches of the Vendee, which though finished in general is still being added to by the addition of image galleries as and when I get round to resizing and reviewing the hundreds of photos I took of all the beaches in the Vendee during the summer and Autumn. Well the sun looks like I may come out so I best off out and start the work instead of writing about it.